Image 1 of 45. Click to view fullscreen. Fabulous Beachfront view! Charleston Oceanfront Villas Watch sunrise or moon rise, see the dolphins feed, walk to the fishing pier or the restaurants! Third Floor with covered Lanai! Approximately 15 minutes to downtown Charleston. Decor is nautical with local artists' works! Beach is steps away or enjoy the two pools overlooking the ocean! Third floor in the middle of the building for privacy and great ocean view. Rates-additional charges- 14 per cent tax + cleaning of $150 ( includes unit cleaning + use& cleaning of sheets and towels) $100. Handling fee.
. And a $300 refundable security deposit paid by separate check 60 days in advance of stay. All payments are paid by check to owner. Half of cost is due upon reservation and half 60 days in advance of stay. Balance due 60 days in advance of stay with the additional $300 security deposit paid by separate check. One king bed, 2 queen beds. Each bedroom has a bath! Sleeper sofa, too. Open and airy. Master bedroom has a king bed and overlooks the ocean. It has a full bath with Jacuzzi, double sinks and shower. Oceanfront/ Beachfront with large covered balcony. 3 bedrooms 3 baths. Master bedroom overlooks the ocean! Kitchen has stove, microwave, dishwasher, refrigerator and is fully equipped. Large breakfast bar with 4 bar stools! ~Each front bedroom has a queen bed and full bath. They have seagrass carpet. Swim in the pool or the ocean! Rent jet skis' or take a fishing tour! Enjoy the tour of Fort Sumter by boat or go on an evening sail in Charleston Harbor on the Pride- a tall ship. Folly beach is the site of many local surf contests! Hire a Captain to sail you around the harbor. Try a carriage ride or a stroll along our historic battery with homes from the 1800's. Walk to restaurants ,15 minutes to Charleston. : There are many fine restaurants to choose from. Take a kayak tour with the parks department or one of the local companies and discover our beautiful estuaries and rivers. May and June Spoleto arrives..a festival of art and music. What a great location...15 minutes to downtown ...a few steps to the beach...walk around the town of Folly and enjoy the restaurants and fishing pier. A county park is on the west end of Folly with bathrooms and life guards. There is a boat landing on folly. Put your boat in the river and see our local beauty-dolphins, herons, egrets or go fishing. The east end has a lighthouse. Park at the east end and walk around ... the Morris Island Light House will greet you. Linens and cleaning are included in fee $65.sheets & towels and $85 cleaning total $150. Covered carport on part of the Condos. Two cars can park onsite. 100% refund if cancelled at least 60 days before arrival date. Great place to stay. The location and the views are awesome! Mary Ann was terrific to work with answers all my questions and had great knowledge of the area. Mary Ann is the easiest, most helpful, kindest person we have ever dealt with when renting through VRBO/HomeAway! She made everything so seamless and simple, we felt like we spent no time at all getting in and settled. Her condo was spotless upon arrival and is in a prime area so close to the pier and walking distance to everything on Folly Beach. This rental made our Spring Break 2019 one of the best yet! We will be back to Folly soon and hope that her condo will be available! The condo was very nice, plenty of room for our party of six adults and one child. The balcony right on the ocean is huge; plenty of room for all of us to enjoy the ocean view. The condo was well stocked with everything one needs. Awesome location. In close proximity (less than 5 minute walk) to all Folly Beach restaurants, bars and shops. The condo owner was great to deal with and was very attentive to our needs. I unequivocally recommend this condo! We had a wonderful time during our stay on Folly Beach. The condo was just as described/pictured, so very comfortable and convenient to attractions, golfing and nearby Charleston. We loved being able to walk to restaurants, stores, and be right on the beach. We would definitely stay again. We are a group of women who have traveled together for fourteen years. This beachfront condo ranked at the top of our stays with VRBO. The unit was clean, well equipped, and had fabulous views. Mary Ann was a wonderful host. She kept us informed from beginning to end. We spent one day in Savannah, an easy two hour drive. Charleston is easily accessible, about 20 minutes max. Be sure to eat at Magnolias for a special, but not overpriced meal. Don't miss seeing the Battery. We loved the tour of the old jail! Spooky, but fun! Perfect place for food, fun, and beach! Super comfy condo, great location and beautiful ocean view! So many positives - beautiful condo with 3 full baths, large deck with beautiful ocean view and an excellent location. This condo is very accessible with with an elevator and carts for bringing groceries and cargo up. Also, it is walking distance to Folly Beach - cute town with lots of great shops and restaurants. Lost Dog Cafe (incredible breakfast), Loggerheads and the Crab Shack were three of our favorites. Also, downtown Charleston is a quick 15 minute drive. Check in and check out were super easy. We will definitely be staying here again next time we are in Charleston. Charleston Oceanfront Villas great place to vacation! Folly Beach is a small beach town just 15 to 20 minutes to downtown Charleston. 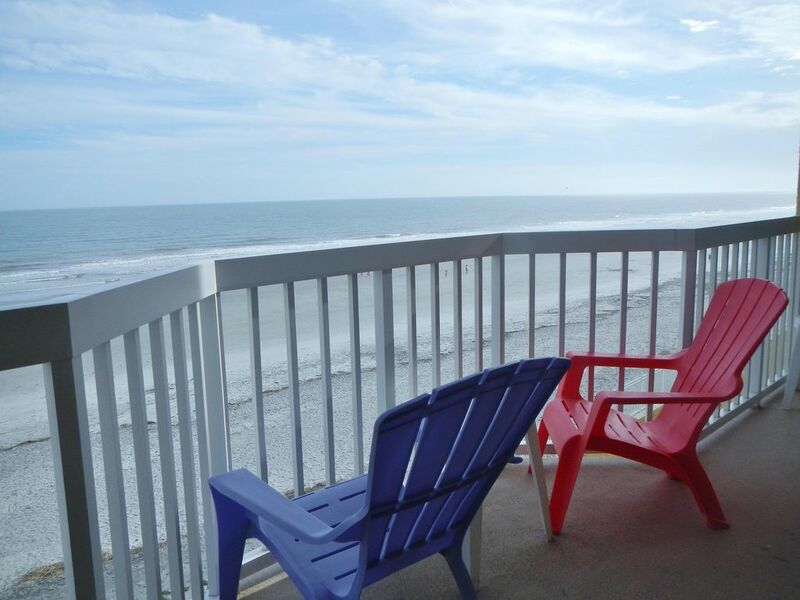 Walk to the local restaurants, a fishing pier, boat landing,and miles of beach are just outside the condo door! Golf: There are many Golf courses in Charleston. From the James Island Municipal Golf course to the ocean course on Kiawah!